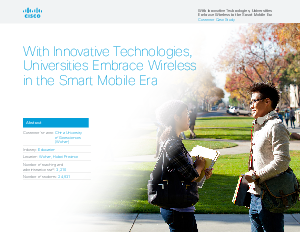 Cisco Helped to Deploy the World’s Largest 802.11ac Wave 2 Wireless Network for China University of Geosciences. China University of Geosciences at Wuhan is one of the country’s leading universities and a national key university directly under the Ministry of Education. Focusing on earth science, the university has national level-1 disciplines in geology, geological resources and geological engineering. in science and technology and a leader in applications instruction. Six years ago the university built a wireless network based on 802.11a/b/g—becoming the first university in Wuhan to deploy this type of wireless network—and has become one of the leaders among Chinese universities when it comes to wireless network development.